What happens when a strapped-for-cash bridal designer needs a stuffed animal...and fast? Up-and-coming bridal designer, Jacqueline Gianakos must fly a Montana taxidermist to Greece in order to stuff her Grandmother’s cat. If Chrysanthemum isn’t preserved within two days' time, Jacqueline will lose the home that was her childhood sanctuary. But will she survive the next 48 hours when the taxidermist ignores her pointed request and then shows up wearing flannel? 1st Place - IDA Awards and the OCW Cascade Awards. What in the world had Ya-Yá been thinking? I took a sip of my frappé, leaned back against the rickety kafeneía chair, and let the brilliant Mediterranean sun warm my face. Sour orange and lemon trees, as well as the occasional acacia, shaded the bustling street where I ate. If I closed my eyes and breathed deep draughts of the salt and citrus wind, would the world make sense again when I opened them? I had spent five years saving so I could have one more summer in Athens with Ya-Yá. Greece was my second country, a mother to me. Stepping off the plane in Athens made my heart beat stronger. Walking these streets was like being swept into the hearty embrace of a loved one. Only this time, Athens was without the woman who had made the city live and sing for me. My grandmother’s sudden brain aneurism left me with an incredibly odd list in her delicate script and no Ya-Yá to tease about it. If she were here, I would raise a questioning brow and point out every outlandish feature on the jasmine-scented page. Ya-Yá usually wrote from her old wicker chair in the garden. If she had penned a summer letter I could always tell by simply closing my eyes and breathing in the lingering fragrance. I’d sped through the first five items. Dust and box up everything in the attic. Personally deliver the boxes to the youth hostel next to uncle Etor’s gravesite. Have Chrysanthemum stuffed. Let the taxidermist know she weighed 32 pounds at the time of her demise. Find and use the coupon from that nice boy on TV. Look in the third drawer of the vanity dresser, or the cookie jar, or maybe behind the kitchen clock, or in my sock drawer all the way at the back. If no one can find it, have the neighbor boy check in the attic with all those cat food receipts. Chrysanthemum was not my favorite feline. She had been an obese white Persian with a palate like the queen of France and all the forbearance of Genghis Kahn. Ya-Yá’s neighbor owned Petunia, Chrysanthemum’s identical sister. A British professor had taken home the third white female from that litter, so thankfully that particular animal had not lived close enough to torture me. The problem? Chrysanthemum liked to be petted on the head and between the shoulder blades. Petunia wanted to be stroked down the back from about mid-spine all the way down her enormous fluffy tail. If I petted Petunia on the head or shoulders, she would hiss and strike out with her claws. Even worse, if I petted Chrysanthemum on the back or tail, she would growl low in her chest, whip around, and sink her fangs into my hand. Instances of mistaken identity gave me a loathing for anything white and fluffy, even coconut cake and s’mores. With the exception of the local felines, Ya-Yá’s house had been my childhood sanctuary. Despite the financial burden and the ridiculous nature of her to-do list, I would do whatever it took to keep her home from being claimed by the bank. But I am not gifted in taxidermy. Pricilla spent a fair amount of sweat and blood (at least she would have, if she were capable of something as vulgar as sweating) in my training. She had taken a details-conscious college grad and singlehandedly turned her into a details-obsessed wedding professional. From twenty feet away, I can spot the single flower in the ring bearer’s boutonnière that will clash with the cummerbund of the back-up piano player. I am able to transform a heap of silk ribbon into a garden of roses, ferns, and daisies stitched across twenty-five yards of satin. But turning off my superpowers is difficult. Through necessity, I have learned to keep my fingernails long and stylish and never wear hunter orange, puce, or chartreuse to work. Tackiness is the unforgiveable sin at Pricilla’s Precious Boutique. A stuffed cat was anathema to all that I had strived to become. But it was either stuff Chrysanthemum or lose Ya-Yá’s house, and the coupon expired in two days. The dreaded preservation needed to be immediate. A handsome Greek waiter approached with my lunch. I’d ordered a lamb kabob drenched in yoghurt and served on fresh pitta bread. I looked down at my plate then back up at the waiter. Evzen grinned. “And so it is. My mother has recently added the drizzle of yoghurt for aesthetic purposes. The kabob is drenched before and during the cooking process. She just thought it looked pretty. The change was not meant to alarm you.” Evzen swept back to the kitchen. I attempted to hide my flushed features by opening the slip of paper beneath my plate. Evzen had been part of every summer I’d spent with Ya-Yá. The son of a neighbor, the one who owned Petunia, we’d spent countless hours playing soccer at the park, hunting for buried treasure in the rocks below the Acropolis, and having tea and baklava with his pet tortoise under Ya-Yá’s juniper bushes. 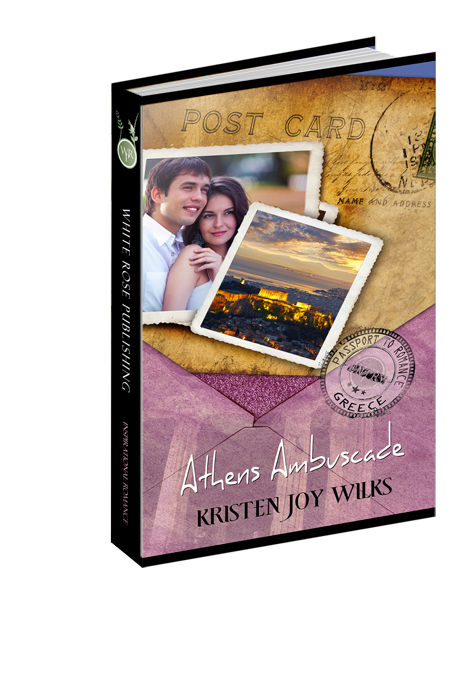 He’d recently moved back to Athens when his father had a stroke. I looked at the sentence scrawled across the paper. He’d scribbled his phone number beneath that bit of helpful advice. If only Evzen had been a dental surgeon, I would have snapped up his offer. But my true love would be a dental surgeon according to an incredibly detailed study I’d completed in my final semester of college. I sighed. Evzen’s non-dental-surgeon-status had reminded me of the least likely occupation possible for my future spouse and the reason I sat at the kafeneía in the first place. I took a bite of my yoghurt drenched and drizzled kabob and zipped a silent prayer heavenward. Thank You for the food, Lord. It is delicious…but don’t You think I could have lived my entire life without eating lunch with a taxidermist? How can I grieve when I’m worried sick over getting Chrysanthemum stuffed? And my coupon expires in two days. I could use a little help, Lord. OK, a lot of help. I spent the last of my savings on flying this guy over here. Would You please make sure he doesn’t get lost, or call me Ma’am, or arrive in flannel? As always, I bow to Your sovereign will, Lord. Amen.